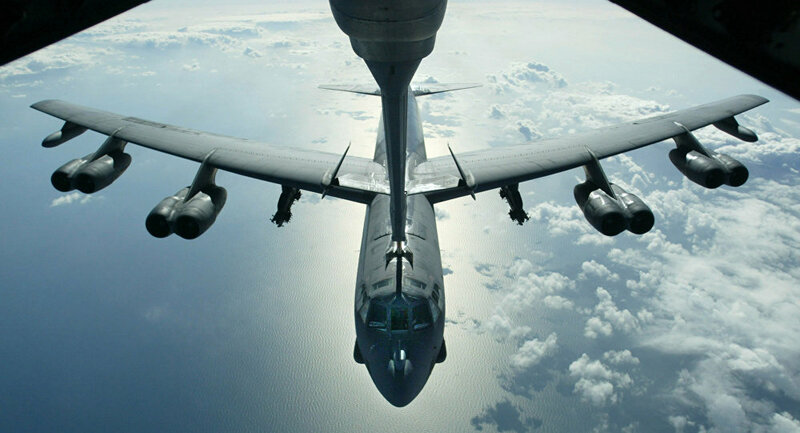 Poking China in its side, the US Air Force conducted several B-52 bomber flights over the South China Sea this week, a move likely to draw Beijing's ire. This week saw several American bombers flying across the contested region, with four B-52s transiting through skies over the South China Sea on Monday and an additional batch on Tuesday that traveled above the East China Sea. Lt. Col. Dave Eastburn told Reuters on Wednesday that the bombers were participating in a "regularly scheduled, combined operation" that was part of "routine events designed to enhance our readiness and interoperability with our partners and allies in the region." "The United States military will continue to fly, sail and operate wherever international law allows at times and places of our choosing," Eastburn added. Bombers on Tuesday were reportedly escorted by Japanese fighter jets as all parties made their way through the Diaoyu Islands, according to CNN. Though the uninhabited islands are controlled by Japan, China has claimed them as its own. When asked about this week's flybys, US Defense Secretary James Mattis told reporters at the Pentagon on Wednesday that the flights were "nothing out of the ordinary." "That just goes on. If it was 20 years ago, and had [China] not militarized those features there, it would have been just another bomber on its way to Diego Garcia or wherever," he said. Diego Garcia, the largest island of the Chagos Archipelago, is used by the US as a military base in the region. The latest development comes after Chinese authorities denied the US Navy's amphibious assault ship USS Wasp port in Hong Kong after the US sanctioned the Chinese military for purchasing Russian military equipment. The rejected vessel was part of a group operating in the Indo-Pacific region, according to Bloomberg.